A special edition of Pokémon Diamond & Pearl. 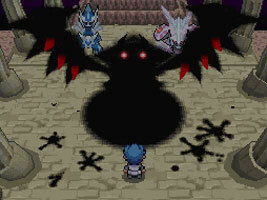 The game introduces a host of new Wi-Fi features as well as new forms of certain Pokémon, including Giratina who can be found in the new, warped Distortion World. The new Wi-Fi Plaza features several minigames and support for up to 20 players. The Vs. Recorder allows players to record Wi-Fi or Battle Frontier battles.